The history of the Native American Flute, indigenous only to North America has been hidden and nearly lost. We're proud to have a selection of books, videos and CD ROM computer programs regarding the Native American flute's rich history. Explore the Native American flute's untold secrets with Dr. Richard Payne, Mary Youngblood, R. Carlos Nakai, Douglas Spotted Eagle, Kevin Locke, Sonny Nevaquaya and Hawk Littlejohn in the profound documentaries Toubat and Songkeepers. See pictures and descriptions of ancient flutes rarely viewed. Gain insight to the traditions of the Hopi tribe and their Flute Ceremony. Discover the earliest form of the Native American Flute, the whistle. 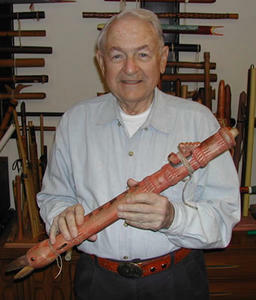 Learn about the development of the Native American flute. Our books cover subjects like history and legends, construction elements and rare photos. Get answers to your questions about and see samples of Native American flutes made by contemporary flute makers like Scott Loomis, Ken Light, Michael Allen, JP Gomez, Charles Littleleaf, Jeff Calavan, Stellar Flutes and more with our CD Rom program. "I received the order today, and would like to thank you for such fast and accurate service. I would also like to let you know that your efforts in packaging make a difference. When I received the box, it had been partially crushed and the styrofoam peanuts were falling out of what was left of the box's endflap. I was expecting a disaster. However...due to the care that was shown when the flute was packaged, it was actually unharmed. With this type of customer service, I feel it would be foolish to look any place else for my flutemaking supplies. May I once again offer my sincere thanks for the quality of your products and service."